Description: SOO Line GP38-2 4424 at Bensenville, Illinois on an unknown day in August 1979, Kodachrome by Chuck Zeiler. I has a couple of extra windows in the cab, I would suppose it came from EMD that way, but I don't know for sure. Description: The CP pulpwood local has a nice Red and White SOO Geep on the point. Description: SPP GP38-2 4424 sits at Bensenville Yard as a plane heading for O Hare airport passes overhead. Description: Stinson Yard bound transfer departs the BNSF with a small train. Title: New yard office at Rice's Point. Description: The last of 6 units on CP 496. Description: CP's La Crosse Road Switch power waits for an afternoon call to duty. Description: Soo 4424 CP 4523 and Soo 4418 bring the BN transfer near the Soo Line Depot in Downtown Minot. Title: Viva The Soo Line! 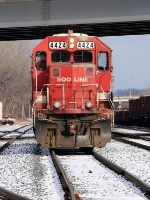 Description: This picture just shouts "Viva the Soo Line!" it is so evocative of it's glory days. Here todays CP/Soo MN&S 0630 rolls north across the bridge spanning the BNSF Wayzata sub and the Cedar Lake trail with one ribside covered hopper in tow and a pair of veteran Soo units at the disposal of the crew. My own motive power -my bicycle- is in the foreground. Description: Train G67, or the "East Patrol," is a mainline local from Milwaukee to Watertown and back. Description: 0 cars have become 6 after the local did its work in town. Description: CP Road Switch works the CP La Crosse yard. Description: SOO 4424 trails CP 4507 and CN 5266.